Kriegsspieler: Dearest M:TG: RULE. BOOK. Chits, lead figures, chess pieces, or silicon chips; in the end, it's all Red versus Blue. I will stipulate that, if I am not yet old in a traditional sense, I am of an age. I am of an age to remember M:TG emerging from Mr. Garfield's mind and sweeping a fair portion of traditional gaming from the field. I was out of graduate school when GenCon became a field of cards and clix. I remember walking through a local convention's Magic hall -- held in a gym as I recall -- and seeing its unslept and unwashed practitioners begging for cards like lepers in an antique slum. I must also grant, for only a great fool would not, Magic's immense success. It created a genre, an industry really, and boasts millions of players over several generations, billions of cards, a world-spanning tournament, and, of course, sales upon sales. Perhaps this is why its creators have lost the deep magic of creating rule books. Those are still fondly thought of, are they not? Documents that describe the proper play of a game, who does what when, what constitutes victory, and tries as best as is possible to navigate foreseeable game circumstance are still an expected part of gaming, no? So when I first played Magic, I learned to do so from the little book of rules that came with it. Perfect it was likely not but it served its purpose. I played the game, found it not particularly to my interests, and moved on. Fast forward nigh 20 years -- as I say, I'm of an age -- and my son is now 10. Pokemon is losing its grip on his impatient mind and I suggested we give Magic a go. He was up for it. We hit the FLGS and came home with the two boxes depicted above. As can be seen, these are pre-built decks from the most recent series and are sold as introductions to the game. I very much liked the suggestion on one of the "Quick Reference" sheets that the boosters remain unopened until the game and then the deck is learned. Eager to start, I looked for the rule book. In his box and mine. Let me give away the ending: there is not one included. Oh, there's the reference card that touches lightly the flow of the game, but provides none of the details. There is no simple statement that tapped creatures may not block. Conversely, there is no indication that creatures suffering from "summoning sickness" can. And, of course, there's no suggestion as to how to keep track on a busy table of which characters are tapped and which are sick. I leave to the side the question of what in the nine realms one is supposed to do with these Planeswalkers. There's also a suggestion that one visit the "start here" website which is well done in its own way, but which contains videos -- hosted by a very enthusiastic young fellow -- which are in no way a proper substitute for a rule book and, I observe, answer none of the questions given above -- save the Planeswalker bit. There is, of course a meta on-line tome of rules. I will not here raise my objection that no rule set for a card game should ever be solely on line. I will, however, observe that even this website is obtuse, inquiring which format for the game you want to play before you've even learned to play it. I would have thought such things would be considered last. It is also a bit unnerving to realize that the last deck you owned would only be playable as something approaching an antique. And do not attempt to learn this game using videos. on YouTube. The official videos are sufficiently incomplete as to be frustrating. That which is unofficial runs along a spectrum. On one end are would-be YouTube plutocrats struggling to form sentences and keep the GoPros they got for Christmas on their heads. On the other end is coverage of the national tournaments where 733+ (is that still a thing?) slang-talking uber-players commentate as two of their peers play the game the way we played Sheepshead in high school, i,e,, far too quickly to make sense of it if you are not intimately familiar with the game. My son and I watched nearly an hour of these videos and began playing a meta game where we raised our hands when we either understood what was going on or grokked what the commentators were saying to one another. M:TG, I understand you have been around for longer than many of your players have been alive. 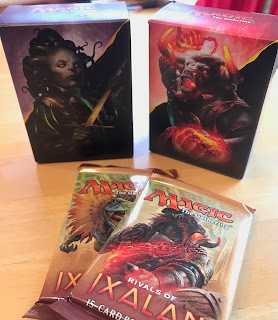 I know card sets have come and gone, rules have grown, and you have even had to ban cards because, clever beasts that we are, we found ways to break your game that you could never have anticipated. I still want a rule book. No, I need a rule book and think a game should come with one. I go by "Cyrano" everywhere the name isn't taken. "TheGascon" has proven a nice fallback.